Dry Eyes: Help is available in Alpharetta, GA. Call today. Dry eyes occur when the eye does not produce tears properly, or when the tears evaporate too quickly. Dry eyes can make it difficult to do some activities, such as using a computer or reading for an extended period of time. It also decreases tolerance for dry environments, such as the air inside an airplane. 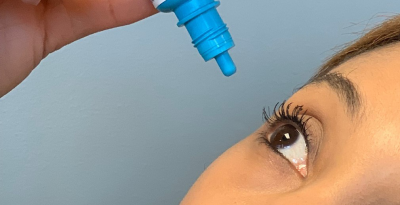 In some cases, dry eye is caused by an imbalance of your tears’ composition, while other individuals don’t generate enough tears in order to keep both their eyes lubricated enough and therefore comfortable. Other factors include problems with eyelids, medications, pollutants, and other environmental factors as well. Getting treated for dry eyes will likely make your eyes feel significantly better. Some of these treatments may include eye drops or certain lifestyle changes. Keep calm and call North Fulton’s best optometry group, Alpharetta Eye Clinic or Windward Eye Care. Let one of our expert optometrists treat your eyes and help you feel great again. Change medications: Consult your primary care physician about switching medications to alternative ones that are not associated with dry eye. Over-the-counter topical medications: Mild dry eye symptoms may be treated with over-the-counter medications such as artificial tears, gels, and ointments. Environmental and lifestyle changes: Cutting back on screen time and taking periodic eye breaks may help. Closing the eyes for a few minutes, or blinking repeatedly for a few seconds, may replenish basal tears and spread them more evenly across the eye. Sunglasses that wrap around the face and have side shields that block wind and dry air can reduce symptoms in windy or dry conditions. Prescription dry eye medications Restasis and Xiidra are medications approved by the U.S. Food and Drug Administration for treating dry eye. Corticosteroid eye drops also may be prescribed short-term to reduce eye inflammation. FDA-approved devices provide temporary relief from dry eyes by stimulating glands and nerves associated with tear production. Punctal plugs can be inserted if other treatments are ineffective. Dry Eyes: The experts at Alpharetta Eye Clinic and Windward Eye Care in Alpharetta, GA, can help with dry eyes. It’s a common condition that can be quite uncomfortable. If you or any member of your family suffer from an eye condition such as blepharitis, glaucoma, macular degeneration, or cataracts, it’s time to call for an appointment to get diagnosis and treatment. These doctors have read the latest research and will treat you with care and respect. Call today.